Fun for all ages! Develop hand-eye coordination skills by popping balloons as they float past. 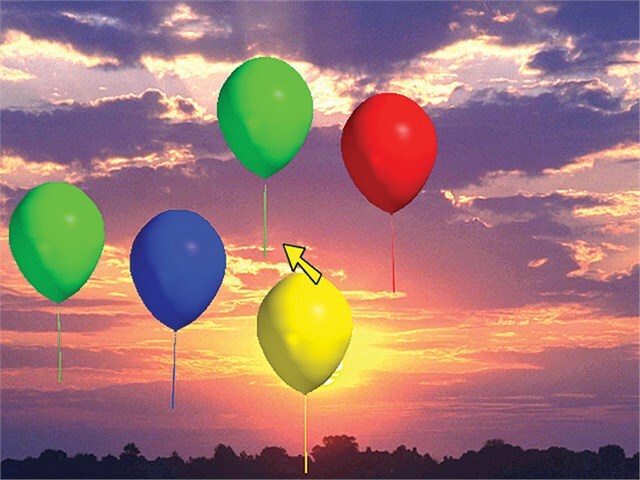 Use the mouse, touch monitor or switch to target and burst the balloons. Choose a large pointer or a cross-hair to aim. An extensive menu allows you to choose direction of travel - up, down, left, right or, a real challenge, random! For the real expert you can also change the speed of travel and the number of balloons. Additional options change the background. You can choose from a range of colours and sky effects or use your own pictures - have the balloons float across a picture of the school. The program has bold or pastel colour choices to allow you to design activities to develop visual and tracking skills.